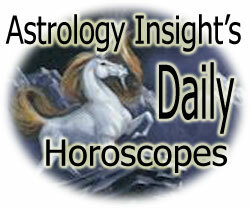 Free Daily Horoscopes from Astrology Insight! From Famed Astrologer Michael Emerson! I deeply hope that you enjoy these daily horoscopes, my life's calling. Don't forget to bookmark! I would be honored if you would like to link your web site to this page. What a nice way to provide free daily horoscopes to your visitors! There is no charge to use these horoscopes on your web site either, just be sure to link back to us, use them as you like! Also for all your zodiac sign information, there is a menu at this page's bottom. Enjoy! You can mix business with pleasure to get favorable results. It's time to reevaluate your own motives and make changes to yourself first. Take the day to relax and pamper yourself. You can anger others quickly today. Avoid overspending on items for your home. You may be overreacting to a situation at hand. Direct your energy wisely today. Anger will prevail if you expect help from others. You need to get out and be an observer. Your creative ideas will be put to good use if you dig in and do things around the house that will make your family happy. Property investments, insurance, taxes, or inheritance should bring you financial gains.